Blue Sky guttering repair residential gutters throughout Birmingham. All our domestic gutter repair services are always carried out efficiently and professionally throughout Birmingham. The original and the best. Gutterline® stops residential concrete/Finlock gutters leaking. Easily, efficiently, cost effectively, and for good. Blue Sky Guttering offers this service for all our domestic customers throughout Birmingham. Blue Sky Guttering Ltd clean all types of residential guttering in Birmingham. We work on all types of residential building in Birmingham. Every building has its challenges when assessing safe access and safely working at height, so together with our 25 years of working at height experience and ongoing training, all our clients in Birmingham can have complete peace of mind when choosing Blue Sky Guttering Ltd.
Leaking gutters can cause serious problems in the structure of your commercial property and can intensify health problems due to mould growth. We are fully IPAF trained, experienced and licensed to use powered access equipment. It is pliable enough to mould to any gutter profile for your home and Gutterline® will tolerate changes in temperatures and building movement without getting damaged by splitting or cracking. The unique Gutterline system creates a totally sealed, fully waterproof ‘gutter within a gutter’ leaving the original gutter untouched so there is no need for any unnecessary costly structural work. Blue Sky Guttering offer gutter residential cleaning services in and around Birmingham. 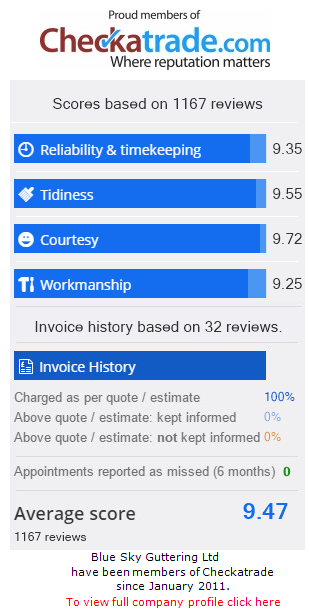 We pride ourselves on being a small team focused on customer service and have built and maintain a strong reputation among a growing number of residential based on safety, trust, service, quality and competitively priced work. We visit all and residential customers with large properties or an unusual access problem, quotation will then be emailed within 24 hours.